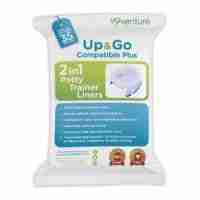 Potty training is a key stage of your Childs development and having the right potty can make it so much easier. 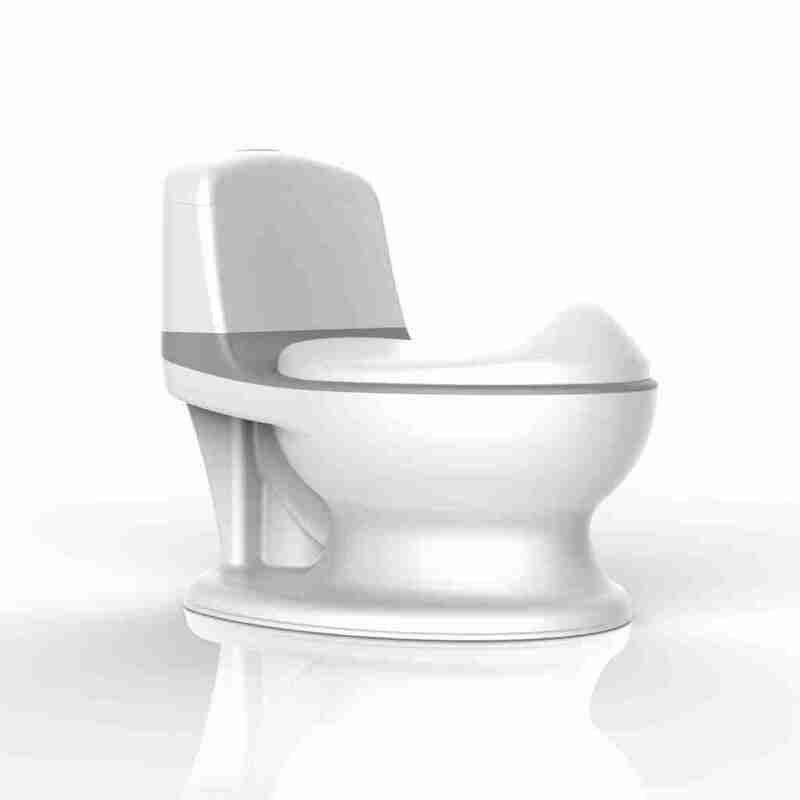 The Pote Plus My First WC makes potty training engaging and fun for your little one. The potty replicates an adult toilet, complete with flusher and wipe storage compartment meaning they can go to the toilet just like mommy and daddy! Subtle grey coloured toilet design childrens potty. 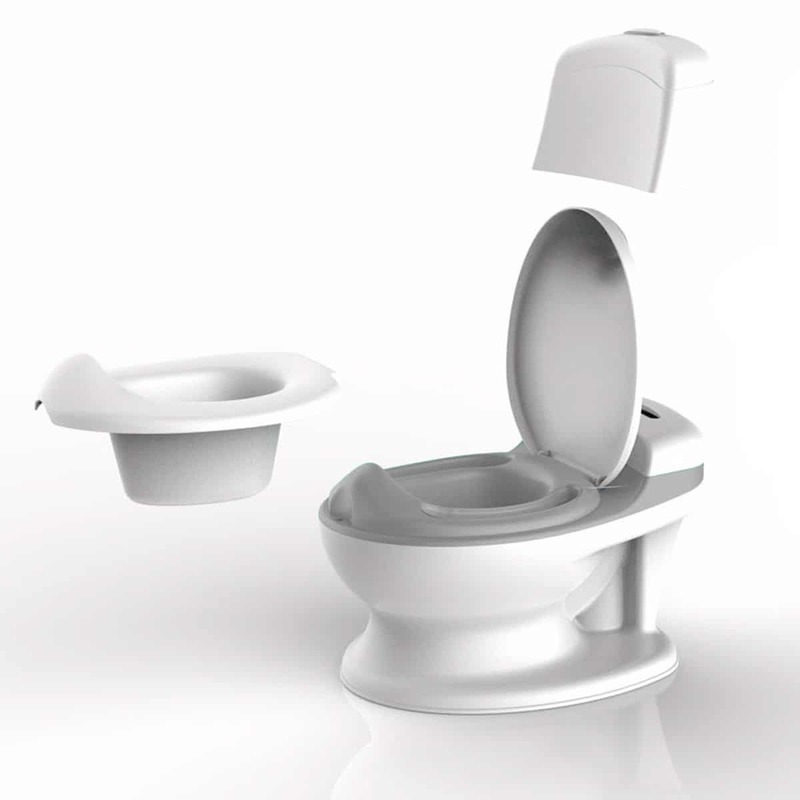 Mini WC Potty with flushing sounds and lights that rewards your child after every use. A stylish alternative to everyday potties that doesn’t look out of place in any bathroom. The potty was delivered very quick we were pleased with it , it’s sturdy and our grandson took to it straight away he loved the idea of the flush I would definitely recommend this product. This Pote is awesome. My son loves it. The unit is well made and easy to clean. Within five minutes of unboxing it our toddler was investigating it, lifting lids and trying it out (hillarious as he didn’t need to go but tried it out anyway!) The flushing button was a genius touch – it adds to the ‘grown up copycat’ experience. This will replace the stepladder/over toilet unit we have been using. I can’t recommend this potty highly enough. If there was one teensy grumble it would be that the batteries are a little awkward to replace as the removable top part is rather narrow for adult hands. Excellent product and such a good height for my toddler! Good fun product reasonably priced and super fast delivery. At the moment she is using it to store things in but hopefully she will learn what it’s really for ! With 3 under five toddlers, we have been through a variety of potty/toilet training aids. This is by far and away the best potty of all those that we have used:The toilet is simple and very sturdy in construction and arrives with a minimum of assembly being required,The lid is a super feature for keeping the potty in a more public area of the house, adds to the appeal for the children and is a real help when a busy patch leads to the potty not being emptied straight away,The potty itself is made of easy wipe material and empties smoothly,The flushing button delights the children with it’s mimicking of the real toilet buttons, their sounds and the dual flush feature,The seating is sufficiently big for my older toddlers who are a little late to training.Very pleased with this item and highly recommend it. 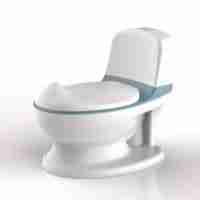 The potty is great and has helped with potty training my child. My grandson thinks he’s a big boy now that he has his own toilet. It’s much better than a normal potty. Incredible. My little boy wasn’t potty trained at all and within an hour we had a pee. A day on from that and he’s doing 1 and 2 in it. Brilliant. Highly recommended and the seller was great too. loves the sound effects, wants to flush before he pees, so we know its rewarding. A lovely item and great service. It looks like a grown up toilet so hoping the transition to big toilet will be easier. Great little toilet for my toddler helped me loads as my bathroom is based upstairs and I must say within the first few days of having this he learnt very quickly on using the toilet and after a week we have got there. Recommend this wen training ur little one. I use to put a nappy sack in there with a tissue folded so u just take off and throw away in the bin. Fantastic product would highly recommend. It’s totally encouraged our child to potty train. Our only issue is we ordered it in grey but received a blue one. Potty training the right way! Designed to make the transition from the potty to the toilet a little easier, the Venture Pote Plus My First WC imitates the sounds, looks and feel of a real adult toilet. It helps introduce your child to process of using a the big toilet at an early age, enocuraging them to lift and close the seat, flush and wipe after each use. If we’re being honest most potties are a little bit bland and boring especially for small children, and more often than not this makes potty training more of a chore for both the parent and child, the Pote Plus My First WC aims to put a stop to that. Now children can use a toilet just like their parents, providing encouragement and satisfaction that they can use a toilet just like everyone else.